Tsukuba, Japan – Atherosclerosis, involving the buildup of plaque in the arteries and an associated reduction in the flow of blood, is a major feature of cardiovascular diseases. Although advances have been made in characterizing how this buildup occurs and ways to reduce it, diseases linked to atherosclerosis are still a major cause of mortality. In a major breakthrough in this field, researchers at University of Tsukuba have developed a tool that can image the development of atherosclerotic plaque in the body and follow its progression over time, enabling accurate evaluation of drugs to treat atherosclerosis and potentially analysis of the likely risk posed by such plaque in individual patients. 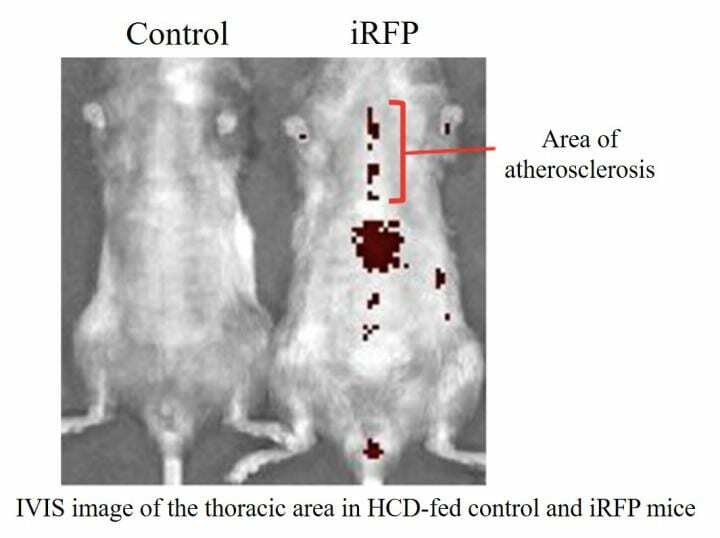 In this study–reported in the journal Scientific Reports–the team induced atherosclerosis in mice by inactivating a fat and cholesterol-related receptor and feeding them on a high-cholesterol diet. They also exposed these mice to X-rays to wipe out the native cells of their immune system, and then transplanted them with genetically engineered immune cells exhibiting fluorescence. "A main advantage of our approach is that the introduced immune cells, as macrophages, congregate in atherosclerotic plaque, so the level of fluorescence emitted by them strongly correlates with the amount of plaque that has formed," Yoshihiro Miwa says. "Because the expressed fluorescent proteins emit light in the near-infrared part of the spectrum, they can be detected at deeper locations within the body, such as the thoracic aorta." To confirm that this method can be used to identify the amount of atherosclerotic plaque within the mice, rather than just whether or not such plaque is present, the team established three different groups with differing feeding patterns. Mice were fed the high-cholesterol diet every day or the high-cholesterol diet and a normal diet on alternate weeks, or just the normal diet. The findings based on the intensity of the fluorescent signal confirmed the expected stepwise differences in plaque quantity among these three groups and also showed clear increases with a longer time spent consuming the unhealthy diets. "Because we can now clearly analyze the amount of plaque present and its change over time, our work should lead to more effective monitoring of how well anti-atherosclerotic drugs work," corresponding author Michito Hamada says. "This method can also reduce the number of experimental animals used because there's no need to sacrifice them and remove tissues for analysis at each time point within an experiment." The team hope to further increase the sophistication of this tool, which could potentially lead to accurate analysis of the risk associated with the buildup of plaque in human patients and produce a range of associated medical benefits.